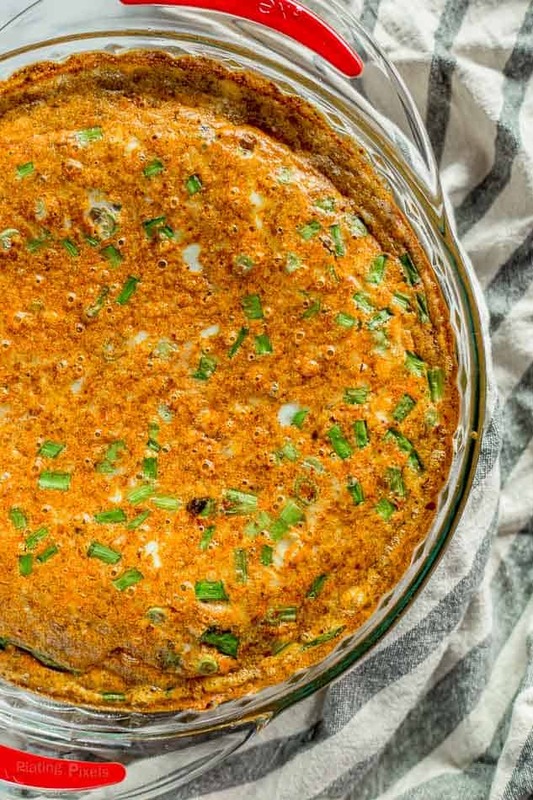 Chorizo and Cheddar Quiche is made with a quinoa and brown rice crust, filled with chorizo, egg, milk, cheese, green onion and spices. Bake into a wholesome, all-in-one breakfast quiche. This Chorizo and Cheddar Quiche recipe is a sponsored post written by me on behalf of Minute® Ready to Serve. All opinions are mine alone. 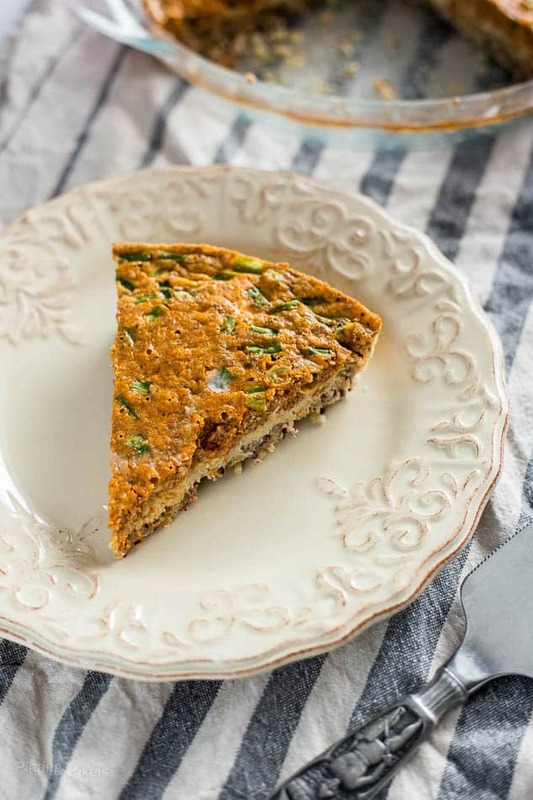 If you’re looking for a little variety in your breakfast, and a break from the traditional scrambled eggs, cereal or yogurt, then look no further than this Chorizo and Cheddar Quiche with Quinoa Crust. To be honest, I often skip breakfast as I’m rarely hungry until later in the day. It makes getting ready in the morning that much easier. A disadvantage is I don’t get to enjoy breakfast dishes like this Chorizo and Cheddar Quiche as often. Don’t let that stop you. It’s a perfect breakfast recipe to make on the weekend, or even for dinner. It also stores well for leftovers, so you can make ahead of time and enjoy throughout the week. Quiches are a simple mixture of egg, milk, cheese and other ingredients baked over a crust. There’s plenty of room for variety and the type of ingredients you can add. I’ve also shared a recipe for spinach and ham quiche. For this recipe, the chorizo and cheddar incorporate into the filling to create a rich, creamy texture with plenty of flavor. 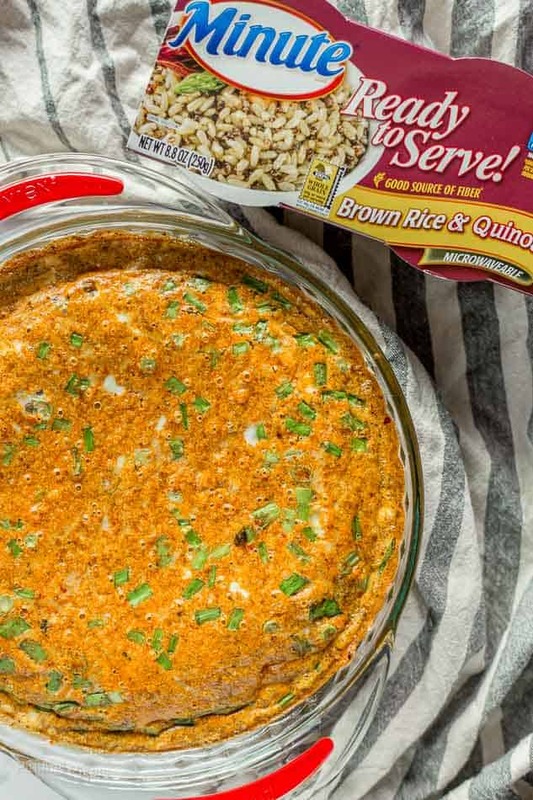 To keep this Chorizo and Cheddar Quiche more wholesome, and gluten free, I used Minute® Ready to Serve Brown Rice & Quinoa. It’s fully cooked and ready to eat, in less than 60 seconds. It makes a time-saving or portable solution for breakfast, lunch or snacks. There are several flavorful and wholesome varieties, which are whole grain and gluten-free, all with no preservatives. The Quinoa and Brown Rice blend contains 55 grams of whole grains and complex carbs. It has a slightly nutty flavor and chewy texture, perfect as a crust for this Chorizo and Cheddar Quiche. Making the quiche is super simple. 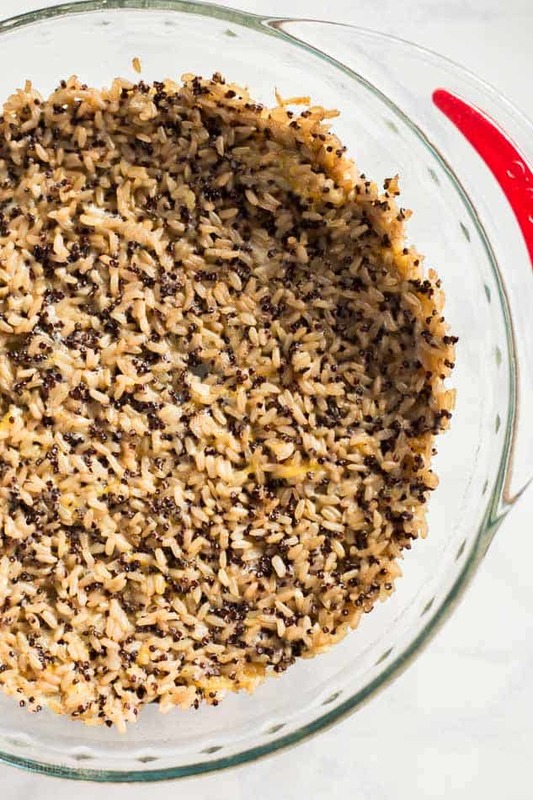 Just mix the pre-cooked Ready to Serve Brown Rice & Quinoa , cheese and an egg, and bake to form the crust. Meanwhile cook beef chorizo, and mix with egg, milk, shredded Mexican cheese blend, green onion and spices. Bake this unique mixture into the crust for a wholesome, wonderful all-in-one breakfast meal. Homemade quinoa and brown rice crust with beef chorizo, egg, milk, shredded Mexican cheese blend, green onion and spices. Bake into a wholesome, all-in-one breakfast quiche. Preheat oven to 375° F. In a medium bowl, stir together pre-cooked rice and quinoa blend, ¼ cup cheese and one egg. Press into bottom of greased 9-inch pie dish to form crust. Bake 12 minutes, until lightly browned. Remove from oven and cool on wire rack. Meanwhile: Cook chorizo in a pan over medium-high heat for 6-8 minutes, breaking up as it cooks. Drain into a fine mesh strainer and press with a spatula to discard oil. Cool meat slightly. 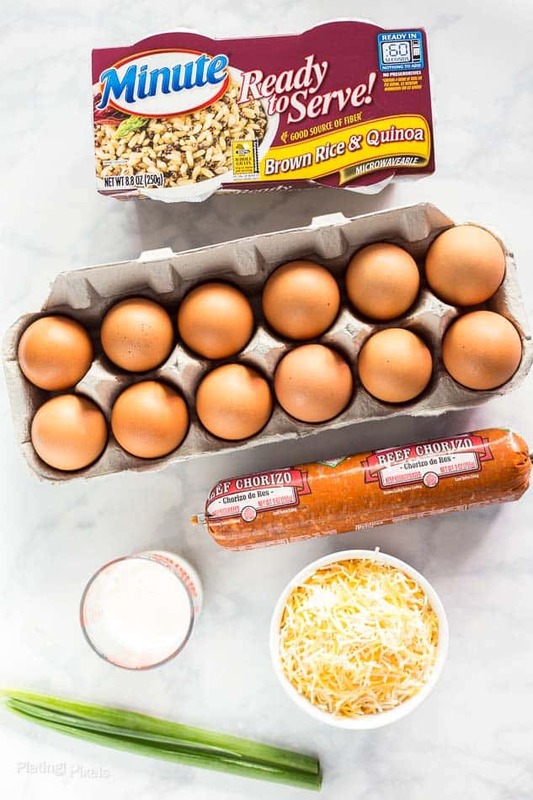 Stir together remaining cheese, eggs, cooked chorizo, and rest of ingredients in a medium bowl. Whish until well combined. Pour into prepared quinoa crust (not filling past ¼-inch from top) and place in center of oven. Bake 25-30 minutes, or until lightly browned and center is mostly set. Place on wire rack and cool 10 minutes before serving. Garnish with sour cream.